Gift vouchers are available to purchase at Lymington and Brockenhurst Buttery restaurants and are for use for Our Luxury Cream Tea £13.50 per person, makes an ideal gift or present. 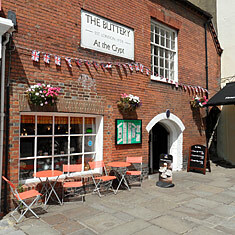 The Buttery group of café / tearooms is an independent group with restaurants in Brockenhurst and Chichester with their own individual style and character. Delicious clotted cream teas with fresh scones are served all day and we are famed for our selection and wide range of homemade cakes. AFTER 70 YEARS. THANKYOU TO ALL OUR PAST CUSTOMERS. Set in the heart of the New Forest, The Buttery Brockenhurst is a Cosy Café/Tearoom and is open 7 days a week with table service at large spacious tables. 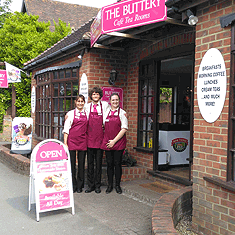 The Buttery Brockenhurst is very popular with locals and visitors. Dating from the late 12th century, this incredibly historic building, in a unique setting next to Chichester Cathedral, is situated only a few shops down from the famous 'Clock Tower' in the very centre of Chichester.